Editor's note: Colorado-based writer Dina Horwedel has done a lot of traveling and writing about the places she's seen. Most recently her impressions of Easter Island appeared in a major US newspaper. She has traveled in Luxembourg, France, Belgium, Mexico, Chile and (former) East Germany. 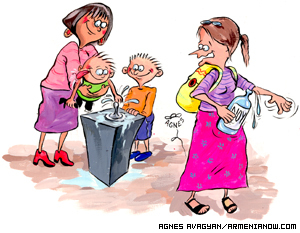 But Armenia, Dina says, is something unique. On an extended working visit here, Dina is learning how to get along in a culture that is particularly foreign to non-Armenians (she has German-Italian ancestry). 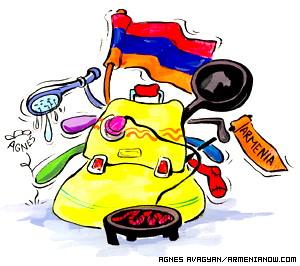 ArmeniaNow asked her to offer some travel advice for the uninitiated. My only previous foray into this part of the world was during Communist times, when I visited the former East Berlin and took a train journey through East Germany. My impressions were of this: the hollow sound of footsteps of KGB agents following my every move, and ducking into a restaurant, where, after every order I placed, I was told "we are out of that." I asked what they did have. "Potato soup." I took the potato soup. I was expecting Armenia to have little more to offer than potato soup. How wrong I was! Armenia still retains the feel of a former Soviet country, but it is idiosyncratic. There is a bustle and frenetic energy that I liken to a country that wants to be known on its own terms, combined with the laid-back atmosphere of a southern culture. We all want a handle to grab when we travel to a new place; a way to define, label, and categorize. France is known for its haute couture and cuisine, Italy for its dolce vita, Germany for its gemutlichekeit, and Britain for its . . . well, Britishness. Armenia? It defies explanation. So rather than attempt to describe what you will feel and experience, I decided to give you some concrete, nuts and bolts advice for how to survive your trip to Armenia. Armenia is not like an ascent to Everest, but there are some things you should know so that you can adequately prepare for your trip. Survival Rule Number 1: Yerevan, Armenia's capital, is small enough that you can see the sights: its museums, plazas, outdoor art and craft markets, and shopping areas, all on foot. That being said, there are a few "rules of the road" tourists need to know when ambling around. Translation: for those of us used to pedestrian crossings, timed lights, and the concept that pedestrians have the right-of-way: There are no rules of the road! Traffic patterns here are haphazard at best. 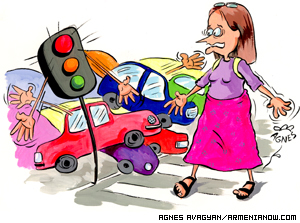 Some intersections boast pedestrian lights and traffic signals, but that doesn't mean anyone - drivers OR pedestrians - pay any attention to them. It's not unusual to see a "marshrutka" (a minivan which serves as public transportation), crammed beyond carrying capacity, with elbows and other various body parts hanging out of the windows, whizzing through a red light. For that matter, it is not unusual to see any sort of vehicle careening madly through a red light: a Mercedes SUV, an old Russian Lada belching black smoke, headed straight for you, while crossing on a pedestrian green, only to honk and swerve away from you at the last minute. Beware the street crossing with trolley lines. They lumber on irregular schedules, leaning drunkenly to one side, their metal sides loosened and flapping dangerously close, out of control, carried forward only by sheer momentum. I have become emboldened by the example of friends, who tell me that you have to attempt to cross the street or else you will never cross. But a great degree of caution is needed, and there seems to be strength in numbers, or at least I blithely assume so when I wade out into the stream of traffic next to old women clad in black. Armenians may not give a damn if they hit a foreigner, but I hope they will think twice about slamming broadside into a group of grandmothers I unabashedly use as human shields. Survival Rule Number Two: Don't drink the water. Everyone I met here boasted the water is the purist in the former Soviet Union and it is drinkable. Remembering back to a trip to Chile and how foolish I felt for filtering all of my water and learning the tap water was treated and drinkable, I took their word for it. I wasn't actually drinking the water, just brushing my teeth in it. Without going into the disgusting details, it took more than a month before I was back to good health, suffering from what I referred to as "Stalin's Revenge." Before leaving for Armenia, my doctor gave me a prescription for Leavaquin, an antibiotic for such things. She told me only to use it in case of extreme emergency, so I held out for 10 days. Finally desperate and figuring my antibodies needed a boost, I took the stuff. I felt much better by day 2. But a week later, it was back. I held out for a few days longer, and then resorted to a week's treatment on another antibiotic. You can buy bottled water of various names - Noy being the most popular -- in most markets. Buy it and use it. 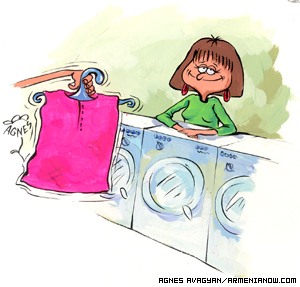 Survival Rule Number Three: Don't wash your best clothes with the hotel or professional laundry unless you want your wardrobe to shrink, turn pink or gray. Apparently everything here is washed in hot water, and separating whites from colors is not a common concept. Survival Rule Number Four: Resist the impulse to under pack. 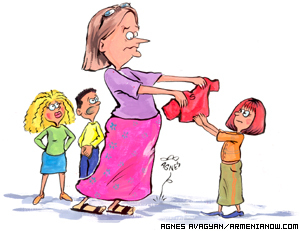 I know, I know, every travel book tells you to take half as many clothes and twice as much cash, but the problem in Armenia is they may not have what you need, and even if they have it, what are the odds that it will be of the same quality, of your taste, or even in your size? I should have known better after Chile. I am 5'8" and a healthy woman. I am not exactly an Amazon, but what we call in my country "a big, sturdy girl." 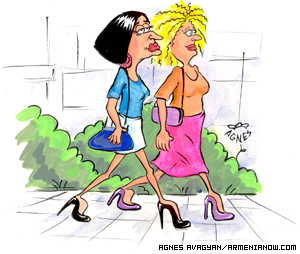 The men and women in my country are much taller and all-around larger than people in Armenia. This makes buying shoes, pants, socks, underwear, bathing suits, all much more difficult. In addition, I am picky. I hate synthetic fabrics, preferring cotton/Lycra blends "engineered" for performance. You can hardly find such things here, and what you can find, you can expect to pay three times more for. On the other hand, there are some surprising bargains to be had as well. But you have to spend a lot of time looking, unless you come equipped with wads of cash that you can freely spend at the Versace store for clothing in a size I have not worn since Kindergarten. In addition, disregard what you read on www.weather.com The weather changes dramatically, and I followed my instincts honed in Colorado and brought a rain coat, a fleece jacket, hat, gloves, and a warm sweater. Even in the summer, with varying altitudes, wind, rainstorms, and the like, I am glad that I did. Survival Rule Number Six: Leave your dietary restrictions at home. Low fat? HA! Vegetarian? HAHAHA! In all seriousness, it can be done, but not without aggravation and missing out on some of the best food Armenia has to offer. 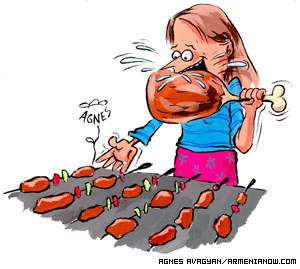 Armenia is famous for its khoravats, barbecue, and people here love meat. Beef stroganoff, steaks, pork chops, you name it . . . and it is all fresh, hormone-free, and delicious. So go ahead! Indulge! And if your religion or political convictions prevent you from eating meat, there are plenty of alternatives. Survival Rule Number Seven: If you aren't going to worry about what you are going to eat, then you certainly should not worry about drinking, other than how to pace yourself. 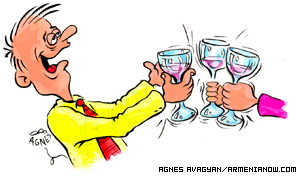 When eating a traditional dinner with Armenians, there is an elaborate ritual for toasting, and it is considered at the worst rude, at the very least, odd, if you do not raise a glass with vodka, or Armenia's famous cognac, to join in. Dinners last for hours, with the toastmaster or tamada making eloquent and poetic toasts throughout. It is considered bad luck to toast with water, but is acceptable to raise your glass and take a sip rather than down an entire shot. Dinners also include Armenian wine and beer, so pace yourself accordingly, and tell yourself you can get back on the wagon once you return home. Survival Rule Number Eight: You have now entered a zone where time does not matter. Put away your watch and relax. 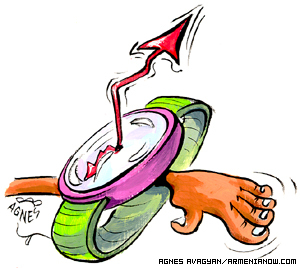 People are often 20-30 minutes late for meetings, and work hours normally begin around 10 a.m. I once asked someone if they could meet me at 9 a.m. and was told it was too early. Besides, what is vacation for but to sleep in? Survival Rule Number Nine: Learn a bit of the local language or at least the polite words like please, thank you, you are welcome, hello, and how are you. It is amazing how delighted people are when you at least try. Armenian is spoken first, and Russian is the lingua franca of the former Soviet states. But many here speak English or at least try. 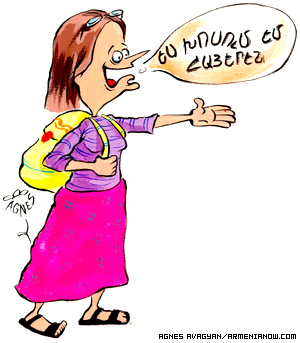 So go ahead - meet people halfway and try to speak a bit to them in Armenian. Survival Rule Number Ten: Bring a sense of humor and leave your expectations at home. It never fails. Every time I travel to a new place, I have an idealized image of what I am going to see and do, and after the first few days of my arrival I am a bit disappointed. Then something clicks in, my mind shifts, and I realize that if I am going to have any fun at all, I am going to need to accept things on their own terms, and this is what travel is all about. Here I have learned to believe hotel staff when they tell me water does not run all day long (I could not accept this as a truth at first), or a driver when he tells me that what looks on the map to be a two-hour drive is actually five because of the deteriorated road conditions, or locals who tell me that when traveling to the countryside I may not get a Western-style toilet or Italian food. I have readjusted my expectations and appreciate things for what they are. If you cannot do this, you probably shouldn't be traveling anywhere in the first place, let alone to Armenia.